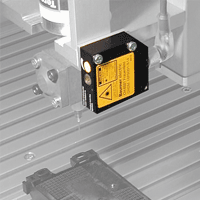 The distance sensor is an accessory, which ensures the dispensing process approaches a maximum in process reliability. The distance sensor is fixed to the dispensing head and measures the distance to the dispensing part before the beginning of the dispensing program. This is done using a laser probe, which determines the distance with a precision of ± 0.1 mm. If the measured distance does not correspond to a given tolerance, for example, once the dispensing part is not positioned correctly, an error message appears. In dispensing mode, a missing or not exactly positioned part is left out.